The Office of Management and Budget (OMB) recently released a combo pack of (supposedly annual) reports on the government’s overall regulatory paperwork burden. This release is long overdue as it includes reports for both 2013 and 2014. The reports detail some all too familiar issues: notable violations of the Paperwork Reduction Act (PRA), peculiar estimation variances, and high federal burdens. A review of the reports reveals an 828 million hour paperwork mistake, 13 ACA-related requirements in violation of the Paperwork Reduction Act, and the Department of Health and Human Services (HHS) as the worst offender in the government. The nature of these releases is the first significant issue. 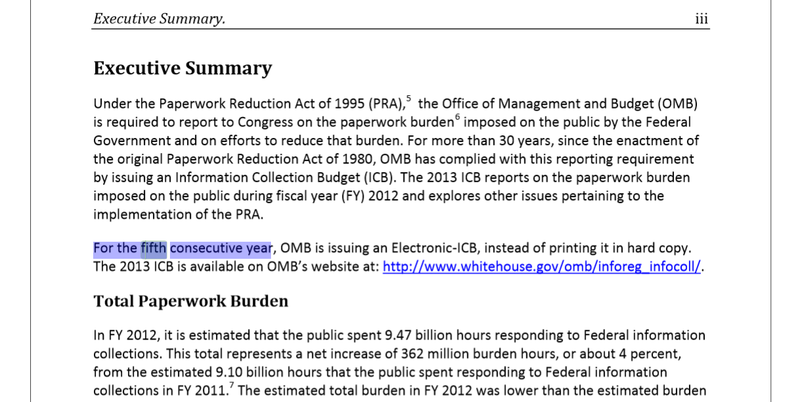 According to language in the reports themselves, “The Information Collection Budget (ICB) is OMB’s annual report to Congress, offering a detailed accounting of the information collection activities of the Federal Government in a given fiscal year.” However, as OMB notes on its own website, the last release came roughly 20 months ago. That was the 2012 report that actually missed the year 2012 by only a month. One of the ICB’s main purposes is to document agency compliance with the PRA. The American Action Forum (AAF) previously reviewed the data from the 2012 report here. An agency violates the PRA by requiring the collection of information without OMB approval or continuing to collect data when approval lapses. In terms of overall trends, it’s a mixed bag as OMB notes that, “Violations decreased by 21—from 303 to 282—relative to FY 2011 and increased by 60—from 218 to 282—relative to FY 2012.” Perhaps it’s a simple rounding issue, but the FY 2012 to FY 2013 increase is actually 64, not 60. On the individual agency level, the Department of Health and Human Services (HHS) is still the most egregious violator. In each report, OMB rates compliance as either “Good” (zero violations), “Needs Improvement” (1 to 25 violations), and “ldquo;Poor” (more than 25 violations). HHS has the distinction of being the only agency to receive a “Poor” grade on both reports, but also to be the only “Poor” agency in the 2014 report. The most recent report also marks HHS’s ascendance to first place among the scofflaws, including the Department of Defense that had actually been ahead of HHS in recent years. HHS is one of the most prodigious regulatory agencies in recent years due to its central role in implementing the Affordable Care Act (ACA). As AAF noted in the previous review, a set of ACA-related information collection requirements (ICRs) in violation of the PRA accounted for “more than 707,000 hours of paperwork and $13.6 million in costs.” The 2013 and 2014 reports detail 13 ICRs in violation that were ACA-related; these requirements account for more than 14 million hours of paperwork and $52 million in costs. The table below includes the five most significant paperwork requirements. Both reports estimate the government-wide total annual paperwork burden at approximately 9.5 billion hours over the course of FY 2012 and FY 2013. However, they note, that figure was roughly 10.3 billion for some time. AAF daily tracking corroborates this, finding that the aggregate government-wide figure was 10.3 billion from July 18, 2012 until December 31, 2012, when it declined slightly to 10.2 billion hours. Below is a graph of paperwork burdens in 2013. On May 16, 2013, it once again reached 10.3 billion hours, where it stayed until August 1, 2014, with a pronounced drop to 9.5 billion hours. Why such a dramatic difference? It turns out that it is the fault of a single paperwork requirement, or rather the fault of whoever estimated its burden. This reduction is attributable to Treasury/IRS correcting the model used to estimate (1) the number of burden hours per respondent (burden changed to 20 minutes per respondent instead of the initially proposed 8 hours) and (2) the number of respondents (212 respondents instead of the initially proposed 101,630,369). It is unclear how one goes from a fraction of an hour to eight or how one confuses 212 respondents with more than 100 million. The exponential drop is not the only major mistake in recent years. Last year, the National Credit Union Administration (NCUA) proposed an ICR that included more than 43 billion hours, or roughly four times the current government-wide total. Due to an AAF comment, NCUA adjusted its estimate to a far more realistic, though still significant, nine million hours. There have been some actions to reduce burdens over the past few years, but the overall trend is increasing paperwork requirements. 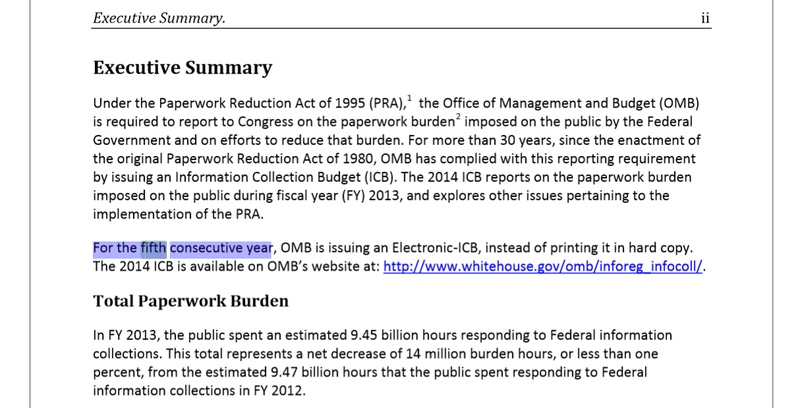 In FY 2011, the total paperwork burden stood at 9.14 billion hours. Today, it stands at more than 9.56 billion hours. This represents an overall net increase of roughly 410 million hours, despite attempts to reduce paperwork and reform regulations. The table below demonstrates the monetary impact of that increase using: 1) the federal minimum wage, 2) the average wage of a “compliance officer,” and 3) real GDP per hour worked (a measure of productivity). As noted, $3 billion to $24 billion in new burdens are significant impacts. Remember, these are annual figures, so $24 billion in the economy diverted to paperwork compliance is a substantial slice. For example, the tax increases from the “Fiscal Cliff” deal were $27 billion in FY 2013. More Burdens in the Future? These paperwork reports are one of the main ways interested parties can look back on how the country’s paperwork burden has changed in recent years. It is also worth looking ahead. In particular, there are currently three tax-related proposed ICRs under review. As noted in an AAF comment to IRS, the “U.S. Business Income Tax Return” would be the runaway leader in terms of paperwork burden hours. While these requested ICRs will potentially have their estimates pared down, it is shocking that our government-wide paperwork burden could soon increase by nearly three billion hours, or roughly one third of its current total. 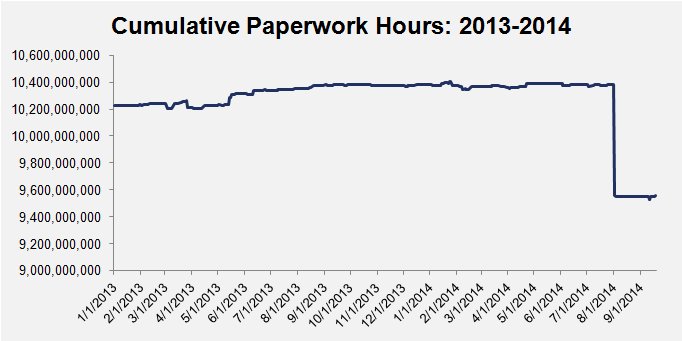 In other words, if approved, the nation’s aggregate paperwork burden could eclipse 12.5 billion hours. The PRA is clear on the need for OMB and federal agencies to report on their collective paperwork requirements each year. This most recent set of reports only continues a series of trends to delay document releases, include flawed estimation methodologies, and seeming haphazard consideration of a regulatory requirement's full effects. Although the PRA does give a valuable look into the overall paperwork docket, further reforms could help remedy some of these problems.